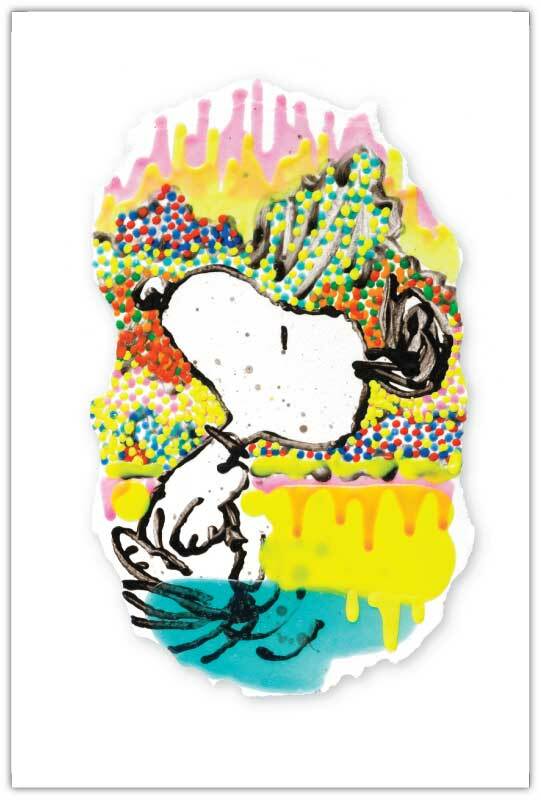 In 1980, Tom Everhart was introduced to cartoonist Charles M. Schulz at Schulz’s studios in Santa Rosa, California. A few weeks prior to their meeting, Everhart, having absolutely no education in cartooning, found himself involved in a freelance project that required him to draw and present Peanuts renderings to Schulz’s studios. Preparing as he would the drawings and studies for his large-scale skeleton / nature related paintings; he blew up some of the cartoonist’s strips on a twenty-five foot wall in his studio which eliminated the perimeter lines of the cartoon box, leaving only the marks of the cartoonist. Schulz’s painterly pen stroke, now larger than life, translated into painterly brush strokes and was now a language that overwhelmingly connected to Everhart’s own form of expression and communication. Completely impressed with Schulz’s line, he was able to reproduce the line art almost exactly, which in turn impressed Schulz at their meeting. It was directly at this time that Everhart confirmed his obsession with Schulz’s line art style and their ongoing relationship of friendship and education of his line construction. 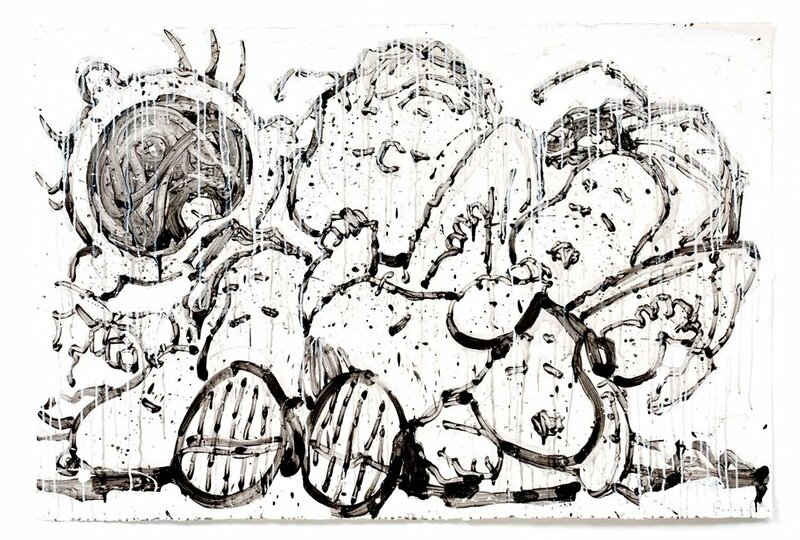 A few years later, while still painting full-time on his previous body of work in his East Village studio, Everhart began drawing special projects for Schulz both in New York and Tokyo. These authentic Schulz-style drawings included covers and interiors of magazines, art for the White House, and the majority of the Met Life campaign. When Everhart was not painting, he was now considered to be the only fine artist authorized and educated by Schulz to draw the actual Schulz line. The paintings using the influence of Charles Schulz’s comic strip, Peanuts, as visual subject matter began and replaced the skeleton and nature related paintings in 1988. The inspiration came to Everhart in Johns Hopkins Hospital, where he was undergoing several operations for stage 4 colon / liver cancer in the summer of 1988. Everhart recalls lying in a hospital bed surrounded by enough flowers to open a florist shop, piles of art books and a stack of Peanuts comic strips sent to him by Schulz. The light streaming in from the window almost projected the new images of his future Schulz inspired paintings on the wall. All the imagery in Everhart’s work, are in some respect derived from Schulz’s design of pictorial space. In January 1990 Everhart’s Schulz related work went on to show at the Louvre in Paris and subsequently in Los Angeles at the L.A. County Museum of Natural History. Montreal at the Museum of Fine Arts, Tokyo, Japan at the Suntory Museum of Art, Osaka, Rome, Venice, Milan, Minneapolis, Baltimore, New York, Houston, Chicago, Las Vegas, Los Angeles and in Santa Rosa California at the Charles M. Schulz Museum. 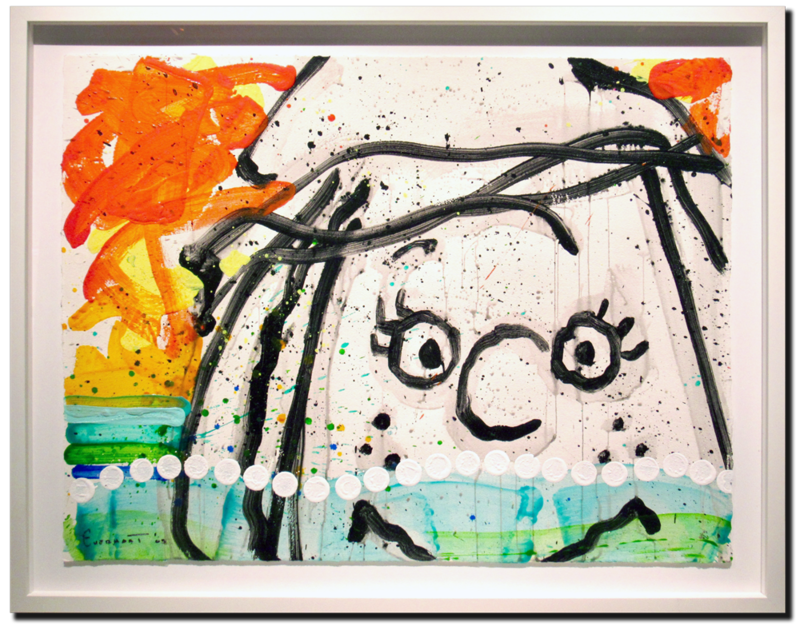 In 1992, Pigpen’s Dirtballs a 72” x 128” painting was filmed with the artist in progress for the CBS special “The Fabulous Funnies”. A series of four lithographs were published in 1996 and a series of four more lithographs entitled, To Every Dog There Is A Season followed in 1997. 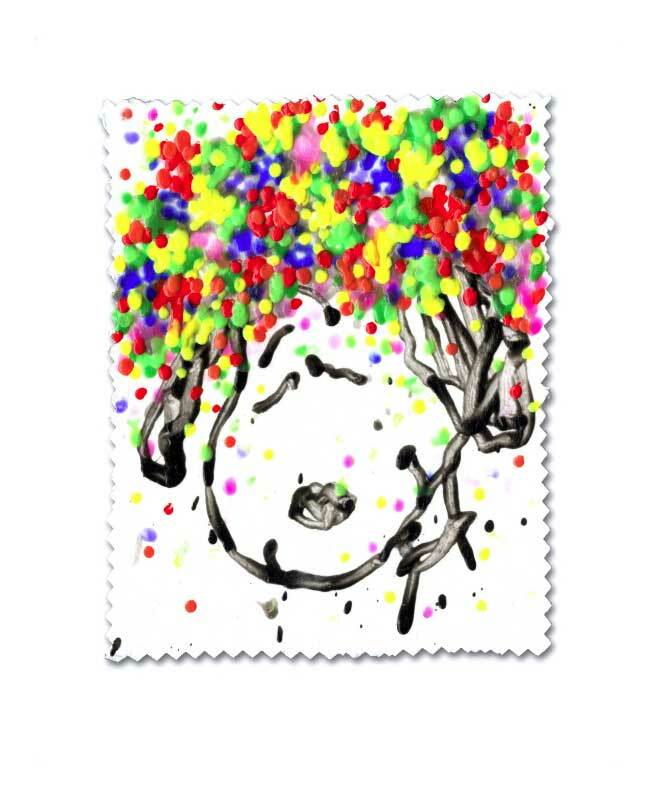 Over the next ten years Tom Everhart would create an astonishing body of lithography work consisting of over seventy-four lithographs. 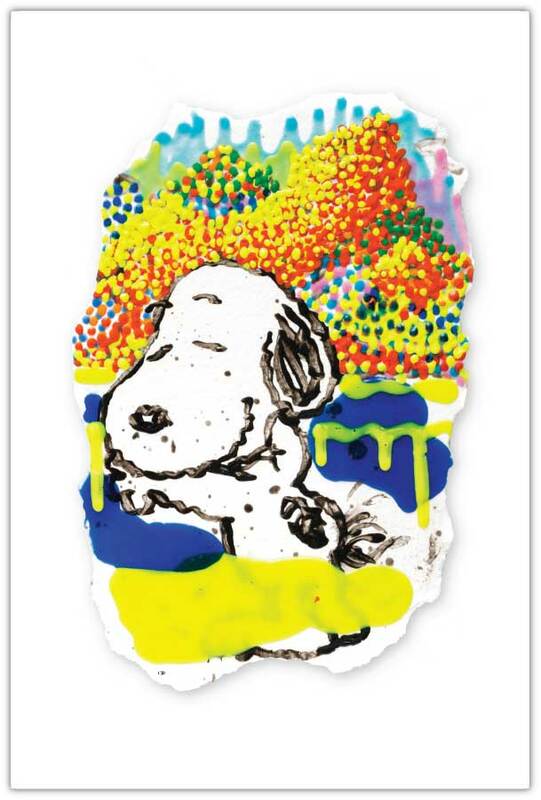 In 1997, Snoopy, Not Your Average Dog, published by Harper Collins, featured an essay and reproductions of Tom Everhart’s Schulz inspired paintings. After Charles Schulz passed away in February of 2000 it left Everhart with a deep sense of loss as well as an even stronger desire to communicate the incredible influence bestowed on him by Schulz. 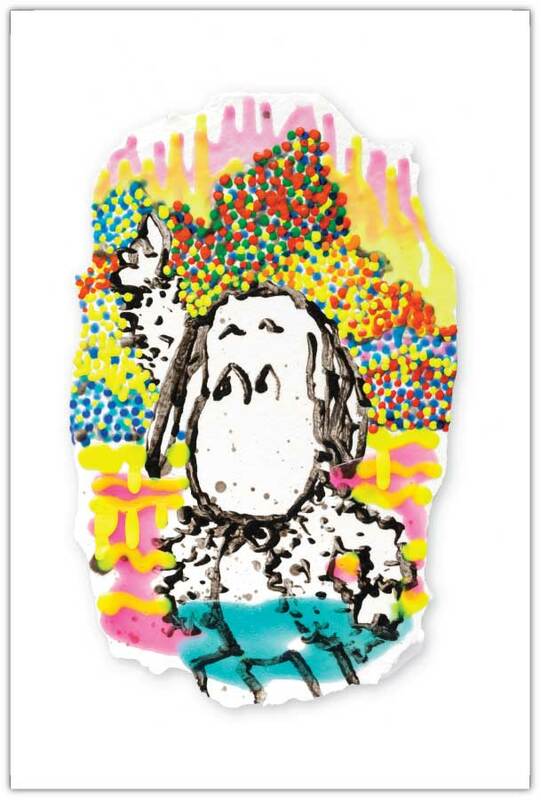 The Charles M. Schulz Museum opened in August 2002 and the following year November 14th 2003 Everhart had the honor of presenting his works in a solo exhibition titled Under The Influence. He would also be included in the Museum’s 2011, Pop’d From The Panel exhibition along with Warhol and Lichtenstein. 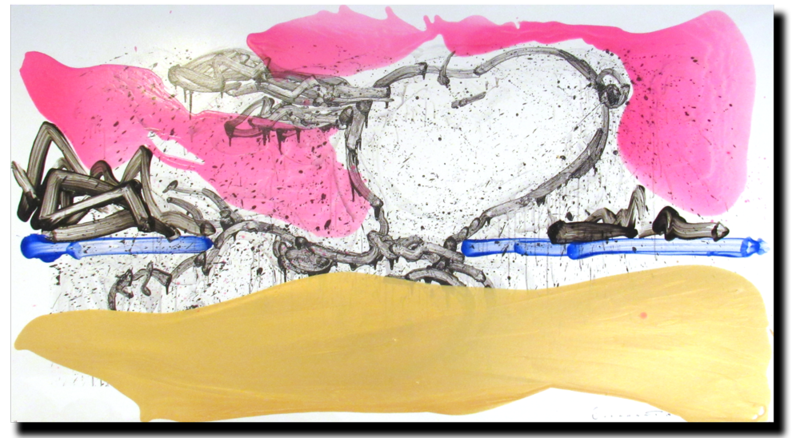 For the next two years Everhart worked to produce two large bodies of works on paper, canvas, and wood. The first exhibition titled Cracking Up consisted of seventy-five artworks. The following exhibition Boom Shaka Laka Laka: The Lagoon Paintingswas made up of three large scale paintings and one hundred fourteen works on paper ranging in sizes for 10” x 12” to 40” x 60”. Both bodies of work were shown at the Jack Gallery in Las Vegas. In 2011 he exhibited 97 works, titled Crashing The Party a solo exhibition at the AFA Gallery in New York. Followed in 2013 with another solo exhibit with AFA Gallery titled Rolling With The Homies consisting of 55 works on paper and canvas. Beginning in 2012, together with Limelight Publishing, Everhart started a print program. 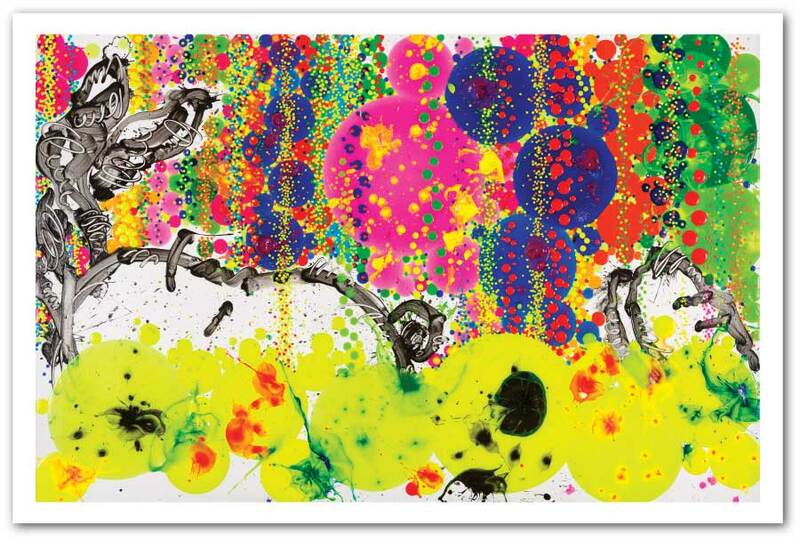 They have produced over 80 mixed media screenprints and continue to produce new works until today. 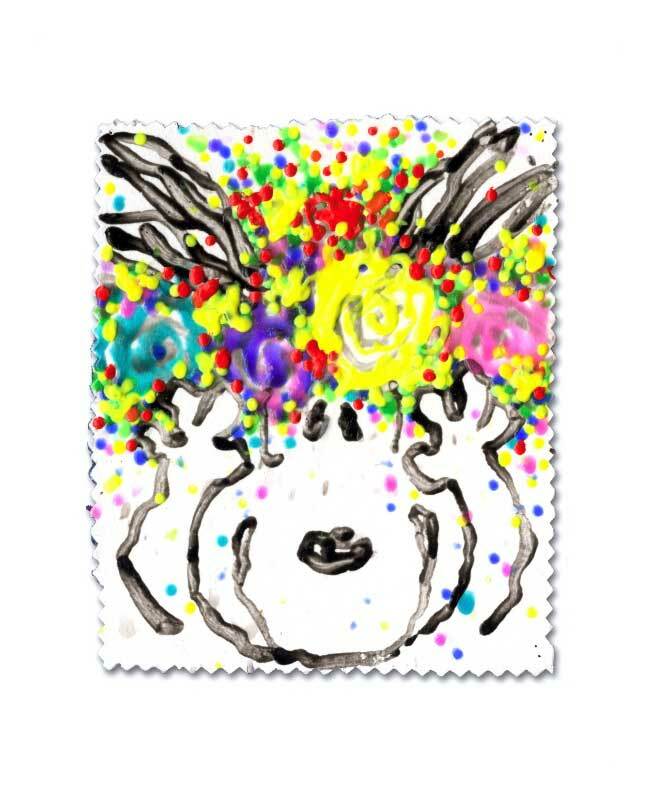 A catalog résumé titled Tom Everhart Recent Print Works was release in 2017. On June 17, 2013 NBC Today show presented a six minute feature on Everhart’s work and career interviewed by Jamie Gangel and produced by Yael Federbush and Jamie Gangel. In March of 2014 the first of two Met Life Global Technology Campus opened in Charlotte North Carolina and the following year in Raleigh. Met Life commissioned over 40 works from Tom Everhart to be photographically enlarged to cover their walls in a brilliant display thought out both campus. 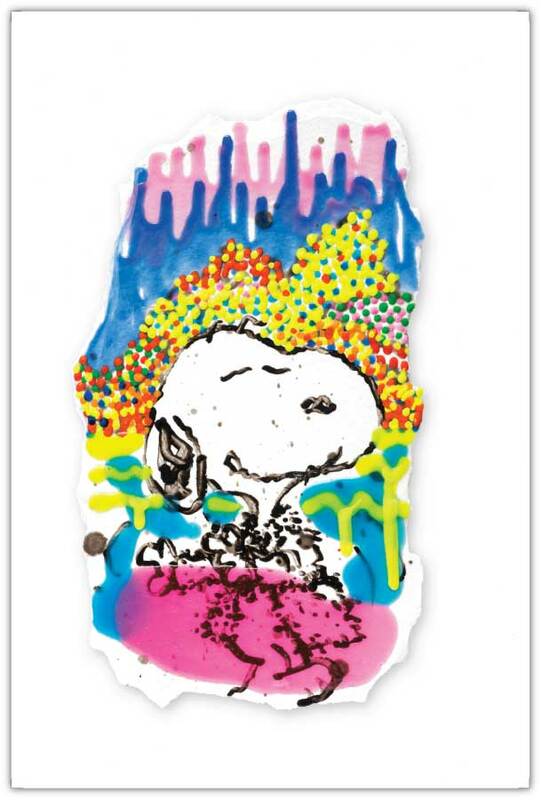 In his lifetime Tom has given countless lectures on the art of Charles Schulz and in the Spring 2014 in an article for Artful Living, writer Alyssa Ford does an impressive job of puzzling together Tom’s lectures in her article titled Master Class. In February of 2016 a retrospective of black and white work titled RAW consisting of 30 works on canvas, wood and paper from 1998-2016 was shown at the Mouche Gallery in Beverly Hills. A catalog titled RAW with an essay by Everhart, Pages from the Coloring Book was published by limelight publishing for this exhibit. The painting Surfing with Franz and Willem from RAW, was actually the first work for the next new body of work Waves of Influence. Each work in the Waves of Influence is meant to reference a particular influence from Tom’s life experiences, that mixed with Schulz’s unique influence, articulates the conditions and reasons for the visual constructions of the last twenty-nine years of work. The Waves of Influence also defines the bubble when working in his studios. Through this bubble Tom sees and feels the world. In November 2017 Waves and Bubble Baths opened at the Mouche Gallery. The last work produced for the exhibition Waves and Bubble Baths titled Sleeping Beauty references a beautiful nation asleep at the wheel, It is actually the first work for the next new body of work Sleeping Beauties. 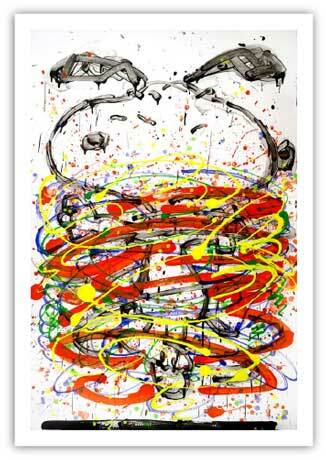 After living in San Francisco, Paris, New York, Washington D.C., Baltimore, and London, in 1997 Tom Everhart moved to Venice California. He and his wife Jennifer now split their time between California and French Polynesia.